Corruption is a word associated with both the Chinese government and the American stock exchange, and in “The China Hustle,” director Jed Rothstein demonstrates the devastating effects when two corrupt systems cross-pollinate. The film fits squarely into the trendy subgenre of financial corruption documentaries that have propagated since the 2008 housing crisis. Slick and meticulous in its explanations of financial phenomenon like shorting (a quick refresher for those who saw “The Big Short”), “The China Hustle” lets its many players tell the story through interviews about their shady involvement, their visages framed through cold, sober lights. These are fraudsters, lawyers, businessmen-turned activists; some are frank and honest, others mealy-mouthed and defensive. “There are no good guys in this story, including me,” starts Dan David, a hedge-fund manager whose company was wiped clean by the 2008 financial horror show. For companies like David’s, and stock trading corporations like Roth Capital Partners and Rodman & Renshaw, incorporating Chinese companies into the American stock exchange offered a new fork in the path, one that didn’t end with bankruptcy. A loophole in the system called a reverse merger allowed cheap stock of nearly defunct American companies to act as proxies for Chinese companies—a win-win for everybody. “The China Hustle” then details the unsurprising reveal that these foreign investments were greatly overvalued. Subsequent sleuthing scenes ensue, in which American businessmen, like Muddy Waters’ founder Carson Block, sneakily survey the physical grounds of paper mills and other companies. The facilities are low-volume and appear deserted; one had a large swathe of rotting cardboard instead of real product worth the billions of dollars the company claimed on its American financial receipts. The fallout from these discoveries caused the more conscientious involved parties, like David, to jump ship immediately. They refused to participate in the system and sold their overinflated stocks. Dave started working on making real change through Congress (which the film reveals to be a frustrating, Sisyphean task). Rothstein’s attempts to interview the increasingly hostile retired general Wesley Clark, whose company Rodman & Renshaw continued profiting from the fraud, runs out of steam at this point, and the doc’s piping-hot energy also begins to peter out. As infuriating as men like Clark may be, their squinty-faced denials in front of the camera are hardly satisfying for the viewer. The frank, level-headed tone of the documentary does not transform into the righteous anger that such financial corruption calls for. 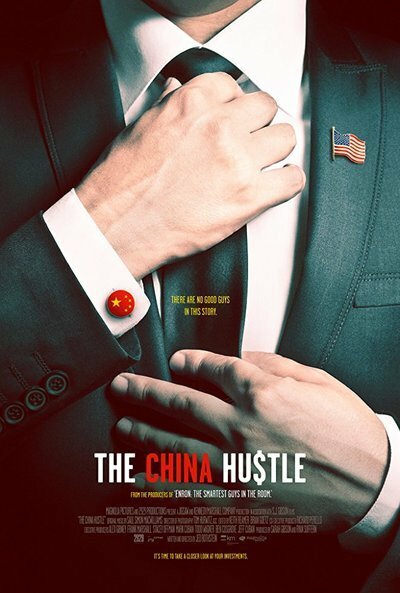 “The China Hustle” calls into question the broader purpose of films like it (there’s also “Dirty Money,” a new Netflix series by Alex Gibney—who serves as executive producer on “The China Hustle”—in which stories of corruption are doled out in bingeable one-hour chunks). These films and series are great at visually explaining hard-to-understand financial concepts and tapping into the knowledge and voices of professionals who’ve had to explain them a million times over to their clients. But they tend to stop short at suggesting real social change. In the case of “The China Hustle,” Rothstein resigns himself to including post-scripts about the billions of dollars stockbrokers in the know have gotten away with. Great. Is there anything the American people can do to fight the system, or help David’s cause? “The China Hustle” is not interested in offering a crumb of hope, thereby enabling the frustration it will inevitably arouse in viewers to dissolve into apathy once the credits roll.